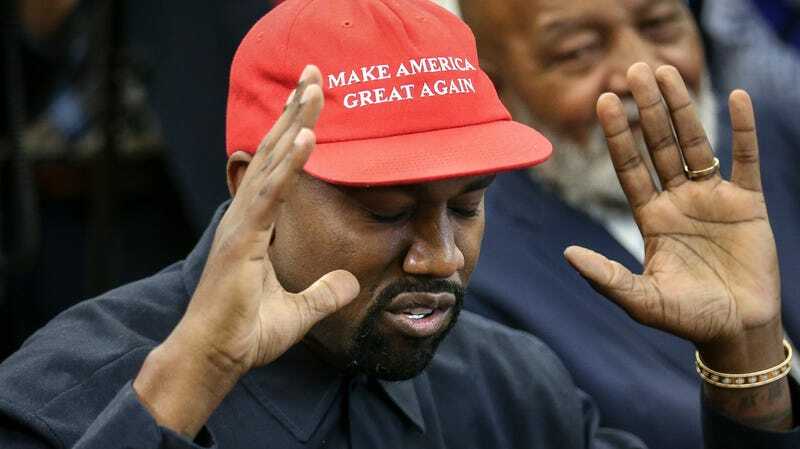 After denouncing the bad-faith grifters who glommed onto his star, Kanye West has—knock on wood—so far managed to uphold his promise to stay the hell out of politics. It felt like something of a soft reboot, then, when he and Kid Cudi debuted their Kids See Ghosts stage show at Tyler the Creator’s Camp Flog Gnaw festival on Sunday night, the performance a prelude of sorts to his upcoming album, Yandhi, which he’s promised will arrive by the Friday after Thanksgiving. Alas, despite going to Africa to continue work on it, the album has again been delayed. He announced as much on Twitter on Monday, citing his Kids See Ghosts show as inspiration for this latest delay. Ultimately, this is probably a good thing, as Ye felt undercooked and The Life Of Pablo saw itself annoyingly, endlessly revised in the wake of its release. It does, however, give us more reason to not believe a word that comes out of the dude’s mouth. That Kids See Ghosts set did more than enthrall fans and invigorate Kanye, however. Lorde, the New Zealand pop star who typically uses Instagram to review onion rings, took to the platform on Monday to insinuate that West and Cudi pilfered her stage show. On her Melodrama tour, Lorde integrated a giant rectangular glass box into her live performance, one not unlike the massive box West and Cudi performed in on Sunday. She shared photos (see some screenshots from her Instagram story below), and capped it off with the following statement. Whether or not it was blatant appropriation remains to be seen; West, after all, is no stranger to performing in, shall we say, a more elevated fashion.